“X9Hostel” pronounced “Cross Nine Hostel”. It is inspired by the Rama 9 junction in which the hostel locate near. The Rama 9 junction is the new CBD (Central Business District) of Bangkok. So our location offers you many things to do and allow you to conveniently travel using public transport which is important as it would help you save a lot of your time on traveling and more on shopping and partying! 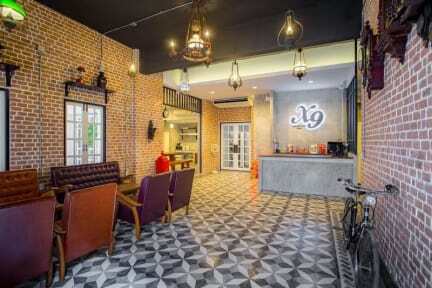 The hostel is a mixture of European, loft and vintage style. Most of our interior furniture give off a loft and European vibe and many of our furniture pieces and decoration are antique in order to give off a vintage vibe and make you feel as if time have stopped and you are send back to the past. I was looking for a place just for the night, flying into DMK late and out of BKK the next morning. This location was perfectly centered between the two airports, and was a quick 10 minute walk to the train station which goes directly to BKK. The staff was friendly, room was spacious and bed was comfortable. I also loved that they had a common area outside the rooms so that I could get situated without waking my dorm-mates. The free self-serve breakfast was an added bonus. 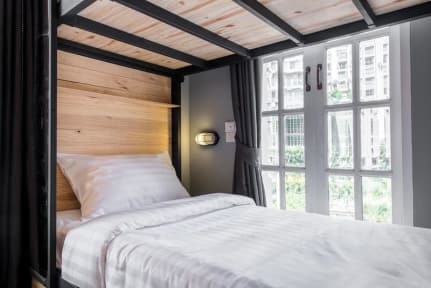 I loved X9 Hostel! I ended up staying here for two weeks while I explored Bangkok. The staff and owners are wonderful! They gave great recommendations and even helped me book the next leg of my journey in Thailand.